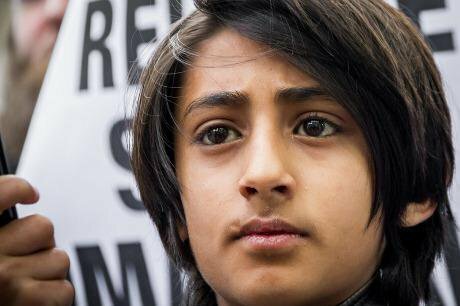 Labile mind: a youngster attending an Islamist demonstration outside London Central Mosque in May. Guy Corbishley / Demotix. All rights reserved. An alleged Islamist plot, dubbed “Trojan Horse”, seeking to bring hardline practices into Birmingham’s schools, has stoked fears that Islamic fundamentalists in Britain are cultivating a new generation of radicals. The prime minister, David Cameron, responded by calling on schools to promote purportedly “British values”: freedom, tolerance, personal and social responsibility, and the rule of law. The episode has fuelled Islamophobia, with Myriam Francois-Cerrah alleging that the discourse on British values “smacks of neo-imperialism and casts British Muslims as subordinate to white, secular liberal Britons”. It has also ignited a cultural battle against the spread of Islamic fundamentalism in the UK. To reverse this trend, however, it is important to understand the reshaping of Islam in Britain and how this has led some young British Muslims to wage jihad in Syria and Iraq. Muslims have been arriving on Britain’s shores for decades. The majority were subjects in the Indian subcontinent of the British raj—a governance system, based on communalism, which drew Hindus, Sikhs and Muslims into open conflict. When British rule ended, Muslims began to migrate en masse to the UK, where the segregated experience of the Muslim community under the raj was replicated. The creation of a multicultural polity allowed Britain to appear tolerant by showering Muslims with rights while segregating them from the rest of British society, rather than pursuing integration. Multiculturalism thus created a semi-secluded Muslim community. The UK media have engendered the notion that the supposed values of a British-Muslim, religion-based culture are incompatible with what is deemed to be western society. There is a confusion, however, between Islam as a religion and “Muslim culture”. A religion is usually embedded in one or more cultures, but cannot be reduced to a single culture; this is why Islamic fundamentalists seek to define a ‘pure’ religion untouched by culture. Britain must assuage the mistrust in the Muslim community stemming from concerns about foreign policy, domestic “counter-terrorism” measures and the anti-Islamic rhetoric of the media. The role of Islam in shaping contemporary societies has been overemphasised: the faith itself is becoming westernised or even globalised. And the perceived opposition between British and Islamic values is biased, because British values are perceived as being consensual among all Britons bar the Muslim community. Cameron has failed to realise that the UK holds no monopoly over these universal values, to which all human beings—including British Muslims—can and should adhere. We must now consider Islam a western religion, due to the second- and third-generation Muslim population which has taken root in the west. The fading of mental borders is not just a consequence of immigration but is linked with a more general deterritorialisation: Islam is less and less ascribed to a specific place. This deterritorialisation has led to a quest for definition by the individual believer—what it means to be a Muslim living as part of a minority in the UK. That journey may lead towards liberalism but it can also end in fundamentalist rejection of British society. In both cases, however, the process is individual, not collective. ‘Re-Islamisation’ never occurs through the social pressure of the family or community but as the result of an individual quest, which often leads to an encounter with a radical preacher at a local mosque or websites propagating militant Islamist ideology. The fluidity of Islam and the absence of a hierarchy of authority within it have made the religion very easy for fundamentalists to manipulate. They target individual British Muslims rather than communities for the simple reason that they have no political or social project, only the implementation of sharia. Islamic fundamentalism has a strong appeal among disenfranchised, second-generation Muslims as it addresses individuals who have doubts about their faith and identity. It offers a way for believers to break from the bonds of family and religious institutions, and encourages a personal return to the “true” tenets of Islam. For hundreds of British Muslims, their individual journey has taken them to Syria and Iraq as combatants of the jihad. There are now fears of a blowback from the Syrian and Iraqi civil wars, with fighters returning to the UK even more radicalised. Britain experienced a similar phenomenon after the Soviet war in Afghanistan, when London became a centre of radicalisation due to the number of “Afghan veterans” who settled there. To combat the radical narrative, Britain must realise that the battle isn’t with religion, but with the ideas that are driving people to extremism. The war of ideas is a delicate phenomenon: many who get involved in extremism do so out of a desire to “do right”, whilst others struggle to distinguish between credible and non-credible sources of religious scholarship. To navigate Muslims away from the path of fundamentalism, the Muslim community must break the monopoly of older, foreign-born imams over UK mosques—the growing generation gap has disconnected and alienated many young British mosque-goers. A change of guard is needed, with young liberal imams given the opportunity to gain popularity and influence, not just within mosques but also on the internet. With a stronger presence and a louder voice, these new liberal leaders will act as a visible source of guidance for disaffected British Muslims. The radical narrative will not simply disappear, however. The socio-cultural issues which are making people receptive to radical ideas when presented to them must be addressed. Britain must assuage the mistrust in the Muslim community stemming from concerns about foreign policy, domestic “counter-terrorism” measures and the anti-Islamic rhetoric of the media. Cameron’s “British values” approach will ultimately fail to curb radicalisation, as it simply casts undue suspicion on the Muslim community. But if relationships are built with members of that community, rather than demonising it, many young British Muslims will begin to reinvent their faith within a British rather than a fundamentalist context.